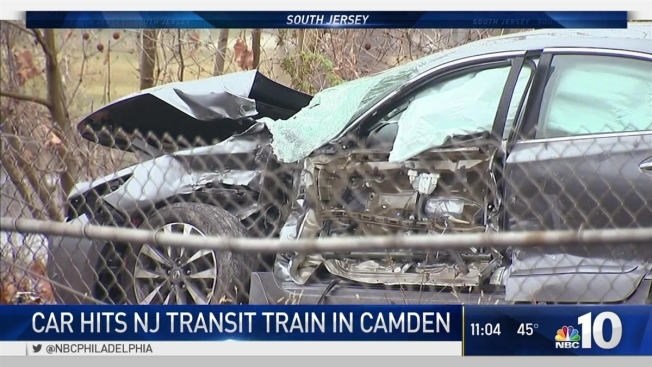 New Jersey Transit suspended service on its RiverLine after a driver disregarded a railroad crossing and crashed into a train Wednesday morning in Camden, said the transit agency. The crash around 6:20 a.m. left light rail line service suspended between 36th Street and the Walter Rand Transportation Center, said NJ Transit. The wreck left the car with damage to the drive-side door. No one on board the train was hurt, said NJ Transit. But, three of the four people in the car were taken to the hospital and the female driver was treated for chest and elbow injuries. After about an hour, NJ Transit announced that trains would operate with 15-minute delays in each direction. The driver was issued a summons for disregarding a railroad crossing, said NJ Transit.